So I FINALLY saw Pirates of the Caribbean 4 - On Stranger Tides. I'm not sorry I waited for it to hit the cheap theaters. I am not sorry I saw it in 2-D either...there were a lot of dark scenes that I think would've been hard in 3-D (at least, every 3-D movie I've been to was really dark!). 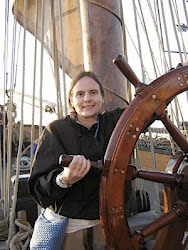 Oh, my ship's wheel picture is on the HMS Surprise, which played the HMS Providence in the film. The HMS Surprise out of movie make-up. I liked the film, though my expectations were bilge-low, so I was delighted the film turned out to be OK. For a movie that's over 2 hours long, it seemed odd there were so many loose ends. I didn't really buy any of the romance, and while I love to see faith and religion at least alluded to in a movie, the only characters who ended up making God any sort of priority by the end were the Spanish Catholics! To me, there seemed to be more effort at integrating history in this one, at least. Although actually, almost all the historical aspects were also covered in The Complete Idiot's Guide to Pirates. So I'm not sure if the movie writers read that book for research, or if the authors of the research book were influenced by Tim Powers' On Stranger Tides (which I haven't read). And actually, if I hadn't been familiar with the material of The Complete Idiot's Guide to Pirates, parts like sailors being forcibly impressed into service might have gone over my head. Though if you go to one of these movies for the plot, I reckon you have the wrong idea...I found it to be a bit more fun than movies 2 and 3. Then again, some people find the idea of swinging from great heights in human-bone cages hilarious, so if you're one of those, you might not like Stranger Tides nearly as much! Anyway, I found it enjoyable and worth seeing for $2 on the big screen!